Use our Virtual Phone System to make Calls and Send SMS from your PC! 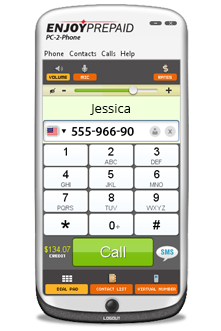 PC-2-Phone is a FREE FEATURE that can be used by anyone who has an Enjoy Prepaid calling card! Windows Xp, Vista, Windows 7. Requires soundboard, earphones or speakers, microphone. You need to have an Enjoy Prepaid calling card in order to use PC-2-Phone. with the same low rates! Enjoy Prepaid PC-2-Phone brings a brand new set of features, available for all clients who have an Enjoy Prepaid calling card; you can download it for free and start using it, with any of your existing cards, immediately. Did we mention you can also send free SMS* to any phone number in the world? *free SMS is a limited time offer. To start using PC-2-Phone, you only need to have an Enjoy Prepaid calling card (with a PIN), download the latest version, install it, select the PIN to call from and start enjoying your calls! To keep things simple, you will be able to log in with your Enjoy Prepaid username and password. You bet! There's so much more you're going to love about Enjoy Prepaid PC-2-Phone: you can save your contacts and connect in just one click; get a Virtual Number so others can call you ... and many more! Don't have an account with Enjoy Prepaid yet? Visit our homepage and get a prepaid calling card; after that you can download PC-2-Phone and use your credit to make low rate international calls with both your calling card and the PC-2-Phone application. Send SMS to any cell phone in the world! PC-2-Phone also makes it very easy for you to send text messages to practically any phone in the world! You can send text messages to contacts in your contact list, or to new numbers. And actually writing the text is also a lot easier, since you can use your PC's keyboard. Text messages are a great way of reaching people when you can't call them; maybe they're at work, in class, in a conference, or they simply can't answer their phones for some reason. Get your message through by texting them instead! Send SMS for FREE - limited offer! Yes, you got that right! You can send SMSes to any worldwide destination without paying a dime. Download Enjoy Prepaid PC-2-Phone right now and start enjoying this great offer before it expires. 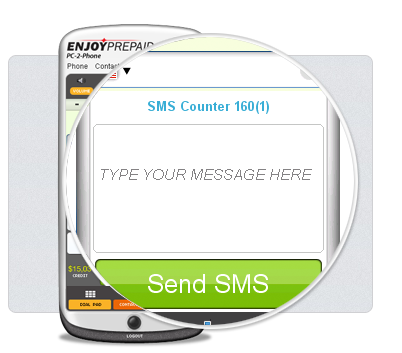 Free SMS offer applies in the limit of 3 SMSes of maximum 160 characters, each day, for each account. Important Note: You need to have an Enjoy Prepaid calling card in order to use PC-2-Phone an all options associated to it, including SMS.